KoopaTV: Consider Enrolling in the Big Brain Academy! By LUDWIG VON KOOPA - Tuition-free, so it satisfies Bernie Sanders. There's a mandatory student activities fee of $6.99, though. Today's Wii U Virtual Console releases include the Nintendo DS Touch Generations title Big Brain Academy. Not everyone is enthusiastic about it. People point to other countries' Virtual Console services. Yes, Europe just got Pokémon Mystery Dungeon: Red Rescue Team and Pokémon Mystery Dungeon: Blue Rescue Team on the Wii U Virtual Console this week. Amazing games — the first ones in the Pokémon Mystery Dungeon series — and if you live in Europe, own a Wii U, and have never played either before, you really need to pick one of them up. However, Big Brain Academy is still pretty good, and a lot better than some of what the DS Virtual Console has gotten before. I know. I own it on the DS. It's really fun. The title music even got remixed for Super Smash Bros. Brawl, and brought back for Super Smash Bros. For Wii U. Take Brain Age and replace Dr. Kawashima's creepy polygonal head with a whimsical environment and fun touch screen games and you get Big Brain Academy. It doesn't focus on the age of your brain, but how much your brain apparently weighs. And it also focuses on aspects of the brain and how much your brain is focused on them. I haven't played the game in many years, and here was how my brain looked when I last played it... probably a decade ago? According to the professor, the average human brain is only 1400 grams. I'm happy to be smarter than the average human, of course. But I was curious what happened to my brain in-between that decade. I only got smarter, right? Michelangelo? The fellow Team Pizza Teenage Mutant Ninja Turtle? Michelangelo is also a fellow shelled lizard, but my score here was sub-1300. We...can do better than the average human! Ugh! Gotta get my brain back up to speed! So I re-took the test. Immediately. At Big Brain Academy you can do that. It's free. Weird school, right? Test-taking isn't all you can do in Big Brain Academy. You can practise for the tests, which are in those five subjects (Think, Memorize, Analyze, Compute, and Identify). There are three activities per subject, for fifteen activities total. Only one per subject is selected for the test. 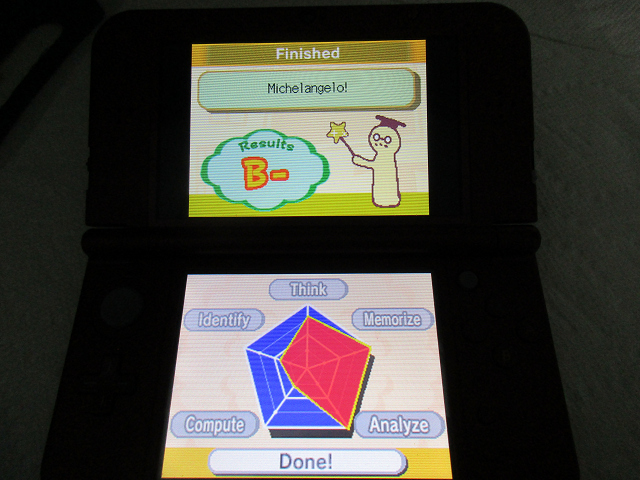 I'm guessing they did factor analysis to determine that each of the three activities for a subject should measure proficiency on the test equally as well, but the reason I did so well in Analyze when I was Michelangelo and relatively poorly as a builder/architect is because of the cube-counting game. It's the only game I have Silver medals on. I'm really proud of my Platinum medal in Compute's Written Math Hard mode. It fits with my love of Donkey Kong Jr. Math, also on Wii U's Virtual Console. I do much better on the other two Analyze activities. So, yeah, your test score is partly determined by RNG. That, or I could put a better effort in getting faster and more accurate at counting three-dimensional cubes. I'm sure if I practised once every day for the past decade, I'd be much better at it and my brain would grow. If you buy Big Brain Academy on Wii U, you can post screenshots of it on Miiverse instead of having to take pictures with a camera. You can actually keep public track of your test records! That's something that other colleges and schools are shying away from. They're afraid of acknowledging that students have different test scores, and they don't want to publicise the achievers. That's why over time, many schools stopped publishing their honour rolls. Apparently, it's unfair to underperforming kids, and it stresses out the school community. 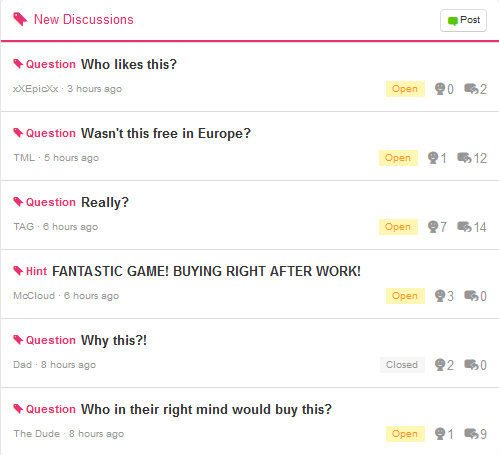 Big Brain Academy, with Miiverse integration, is reversing that trend. While you don't have automatic posts to Miiverse or anything, you can easily press your HOME button and tell the community your feats. What will this do to other Miis looking at how they're performing? Quite frankly, I think the underperforming Miis need to recognise that they're not doing as well as they could. I highly doubt the average brain size for Miiverse users is anywhere close to 1400 grams. It's a lot lower. There are a lot of dumb people there. Though, chances are, if you're reading this, you're not dumb. You have a meaty brain inside you. Why not develop it... at Big Brain Academy? Ludwig won't be buying Big Brain Academy on the Wii U since he obviously still owns it on the DS, and the (New) 3DS is backwards-compatible. He would like to see its Miiverse community be big and bustling, with lots of interested students. Looks like instances of smartness are now being replaced by being clever. If you wish to test your basic arithmetic skills to a timer, consider Bobby Jindal's minigame from The Wonderful 1237. "I'm gonna build a YUGE wall!" Typo or on purpose? On purpose. I've been doing that every time now. Or at least I did do it in the two articles hyperlinked in that caption. Ugh, how could your parents do that?! Did they sell them at GAMESTOP for a few pennies each?!!? I dunno if that's something you can prove...! This other smartest person needs to show their evidence, or I'll say that I'm smarter than them and you should recognise me as such! Alrighty then, XD but I'm not wishing to speak to the "smart person" right now... We kinda had a little squabble recently. But no matter! I shall inform you of the proof as soon as I receive it! Yeah, they never did it again because you don't have anything else left! You got nothiiing. I haven't been pleased with my life for several months. Almost half a year. ...Eh, everything is pretty level for me. So I'm already down the hill. Well, if you want to talk about each other's life problems, maaaybe it's better to do so privately. This sounds more like school than work. I'll stick to testing my brainpower with Professor Layton. You'd prefer work over school? You haven't worked a day in your life, what would you know? Oops, I meant "more like school than fun." ...Oh, that'd make more sense. Hey, I feel for people who are self-employed. I just get the impression you're starving constantly.